Is garnishing and meal accompaniments getting out of hand? Have you noticed when eating out how many desserts, soups, main meals and snacks arrive with extras? This is fine if defined on the menu and most would count themselves lucky if the meal looks bigger as a result. 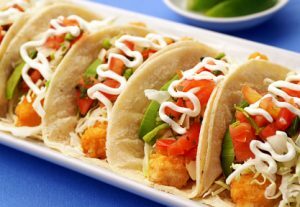 However if your taco arrives smothered in unexpected cheese obviously squeezed from a tube, mustard, aioli, tomato sauce or sour cream the extra fat, salt, sugar and calories can soon add up over the course of a day. Especially if travelling when all meals are eaten out. Also these “add ons” could endanger people with egg, dairy or wheat allergies so it is a topic worth thinking about. So on the bright side a garnish may make food more appealing, colourful, interesting and edible. How do garnishes stack up nutritionally? Generally those based on fruit or vegetables are pretty healthy. So things such as edible flowers, fresh herbs, lemon slices, salsa’s, guacamole, salad or fresh fruit are all fine to eat when served as a decoration. Likewise those with vinegar added such as pickled vegetables, gherkins, olives, pickled onions, mint sauce and vinaigrettes so long as these are kept to a minimum as these foods can also become a major source of salt. If you are serving meals to others there are lots of ways that you can garnish food without adding excessive calories. Serve gravy, hollandaise sauce, dressings separately in a jug on the side. Put condiments such as salsa, mustards, relishes, onion jams etc into small bowls beside the food rather than on it. Slices or pieces of lemon, limes and edible flowers look good arranged around food rather than on them. If wanting to help people to control their weight think to yourself “does this garnish offer fat or fibre”? E.g. Tzatziki offers the fibre of herbs and cucumber compared to sour cream which is mostly just offering the fat. In the same way if making gravies base these on reductions of vegetables such as onion, mushrooms or tomato rather than on meat drippings. Avoid plating up your guests food instead arrange foods so that they can serve themselves. This can also reduce plate waste. When choosing meals at a restaurant ask for sauces and dressings to be placed on the side. If ordering takeaway meals check first to see what sauces come with the food and where possible order portion packs of dressings etc rather than having these squirted in bulk over your food by others. Also mind the toppings added to cakes and muffins. If your work involves travelling a lot and you are finding that many of your meals are being eaten on the run or as takeaway food items then contact us for an appointment to discuss your needs and healthier food choices for a fitter way of life.